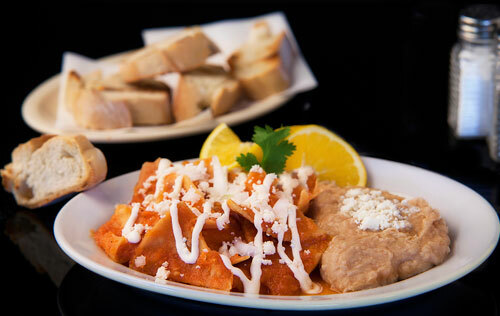 The chilaquiles are a typical Mexican dish that consists of crispy tortillas bathed in salsa . In this recipe the chilaquiles are bathed in a type of red salsa and then they are covered with many ingredients like cheese, onion, coriander, etc. As you can imagine in this recipe you will have a large amount of ingredients combining and complementing; to give as a result an absolutely delicious fusion of flavors and textures. This dish is a very good breakfast and it is an excellent way of starting your day. When the chilaquiles plate is prepared don’t forget to put them refried beans , guacamole , red rice , quesadillas or any appetizer that you like. To make the chilaquiles there are 4 stages to follow: making the tortilla chips, making the salsa, preparing the chilaquiles and the garnish. There are many steps but you can perform them. If you have old tortillas this is the moment to use them as they are the best to prepare chilaquiles – they are the crispiest. The tortillas that are used to prepare the chilaquiles are going to be fried and some vegetable oil must be used since the olive oil is not good for frying dough. In this recipe 1 epazote sprig is used to give a grandiose flavor to the chilaquiles, don’t forget it. This recipe is for 2 persons. Remove the seeds and veins of 1 arbol pepper and 2 guajillo peppers. Bring the saucepan water to a boil over high heat and leave chilies and the tomatoes cooking in the boiling water for about 4 minutes, until the chilies soften. 1/4 of an Onion (1.1 oz). The Red Salsa that was prepared. Cook the red chilaquiles for about 3 minutes, until the salsa has a very thick consistency; stir occasionally. Then set aside. Finely chop 1/4 of an onion (1.1 oz) and 1 coriander sprig; then set aside. Preferably put the ingredients in the same order as given so the chilaquiles look divine. Variation: If we change the red salsa for green we will get some delicious green chilaquiles. Did you like the Red Chilaquiles? Here are some very good corn tortillas, that you can use to make your chilaquiles. If you have a hard time finding arbol peppers, don’t bother anymore and buy these spicy and beautiful chilies. The “Don Enrique Guajillo Peppers" have a beautiful dark red color, they are not spicy and they have a delicious smoky flavor. Some excellent chilies for your red chilaquiles.